I'm finally back! I've gotten my laptop fixed after months of it gathering dust in my bedroom.. so I'm back writing posts again. I've decided to start a blog series on "Instagram products". The first post in the series which you can probably tell already by the heading is about activated carbon teeth whitening powder. Since I first posted about this product ages ago over on my Instagram I've gotten so many questions about it. I think so many people these days are so sceptical about buying products to try for themselves because they're too afraid that people are just posting about them online because they're being paid to. I was sent this product to try out a couple of months back from www.misfitcosmetics.com. They gifted me a couple of their products to try out and see how I liked them. I was so excited to try this out because I had see so many people online posting about it and I was honestly just intrigued to see if it worked. The 'Shine Teeth Whitening Powder' can be purchased directly from www.misfitcosmetics.com for £29.99 which is about €33. Some people may think this is a little steep for a teeth whitening powder but if you see the size of the tub you'll think it's a bargain! 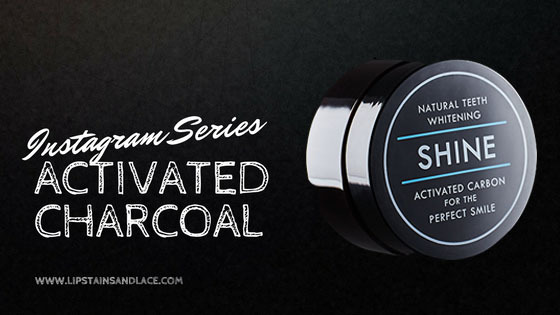 The powder is basically activated carbon which is used to help you get extremely clean teeth and when used regularly it can help get rid of any stains you may have on your teeth. To use the carbon you simply dip a damp toothbrush into the powder and then brush your teeth like you would normally. I will give you a warning though, I wouldn't try using this when I have clean clothes on.. you're better off using this when you're chilled out in your PJ's because the black charcoal can be a nightmare if it gets on your clothes because it's so dark. First time I used this I absolutely destroyed my bathroom with black charcoal, so I would try be as careful as you can with this! I love how squeaky clean the powder made my teeth feel. They definitely felt a lot cleaner and looked much shinier than they would after just using toothpaste. However, I haven't used it regularly enough to notice a difference in the colour of my teeth yet. It did without a doubt make them look brighter after each time I used it though! This is definitely one of those 'Instagram Products' that everyone is raving about simply because it does what it's supposed to. I think it's definitely worth the £29.99 price tag because you only need the smallest amount for each use but you get a huge tub of product! I would without a doubt get this product again after my current tub runs out. You can purchase the Shine Teeth Whitening Powder directly from www.misfitcosmetics.com for £29.99. If you have any questions about this product don't hesitate to leave them in the comments box below or you can contact me on any of my social media accounts which are linked in the sidebar. Just before I go I want to give a huge thank you to the guys over at Misfit Cosmetics for sending me out this product to try.